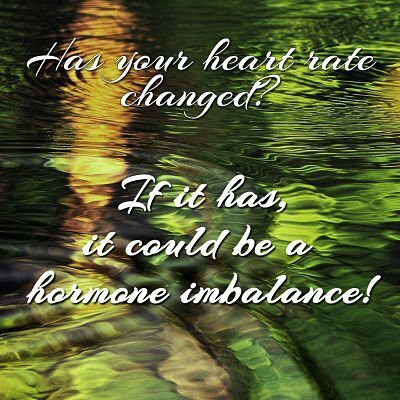 Your Heart Rate Could Be a Good Indicator of a Hormone Imbalance - Fit, Fabulous and Forty! When it comes to thinking about your hormones, most people don’t make the connection between how their heart beats and the function of hormones. But your hormones play a very present role in what happens to your heart rate. There are certain health events that can coincide with changes in the heart rate. For example, when a woman begins to go through menopause, this can cause the heart to beat faster. The hormones that are unbalanced like the ever changing estrogen can cause your heart to speed up. Some women report feeling like their heart was pounding during menopause. If your heart rate goes over 100 beats a minute during menopause, this is said to be tachycardia and it happens just because your hormones aren’t level. Once you get them restored to their proper balance, your heart rate will resume its normal function. Estrogen isn’t the only hormone that can mess with your heart rate. Your thyroid gland can shake up the normal beats of your heart as well. When your thyroid isn’t working right and it’s putting out too many hormones, it will cause your heart to beat faster than it should. It’s common for an overactive thyroid to put the heart into tachycardia. Many women assume that an overactive thyroid might cause problems for the heart rate when they’re active. While it’s true that an overactive thyroid can lead to tachycardia during physical activities, it doesn’t stop there. The problem with the hormones pumped into your system due to a thyroid that’s too busy is that these hormones stay in your body even while you’re resting or asleep. READ Is Facial Hair a Sign That Your Hormones Are Off Balance? So your heart stays in a state of tachycardia and that’s not good for you. Your heart can’t withstand a constant state of beating too fast. It’s a muscle organ and like any muscle, it can be overworked. On the other hand, you can have a thyroid that’s underactive and this can also cause problems for your heart. When your thyroid can’t produce the amount of hormones that your body needs to remain healthy, what happens is your heart rate drops. It can drop your heart rate low enough so that it puts it into bradycardia. At the same time, the lack of level hormones can kick your blood pressure lower than normal and sometimes even to the point you might feel dizzy or like you’re going to pass out. Whenever your heart begins to beat at a new rate, you need to have your hormones evaluated. While you might think that your heart beating too fast or too slow isn’t that big of a deal when hormones are the cause, these same hormones can push your heart to beat too hard, too slow or even send it into an irregular rhythm and that can be deadly. « Yes, Women Need Testosterone Too!